Evernote, the cross-platform note-taking app that now has over 100 million users, is going large on Market, its e-commerce business that sits alongside its core product: today the company is announcing a collaboration with furniture designer Eric Pfeiffer to create a Charles-and-Ray-Eames-inspired series of office accessories with bent plywood and lots of clean lines. 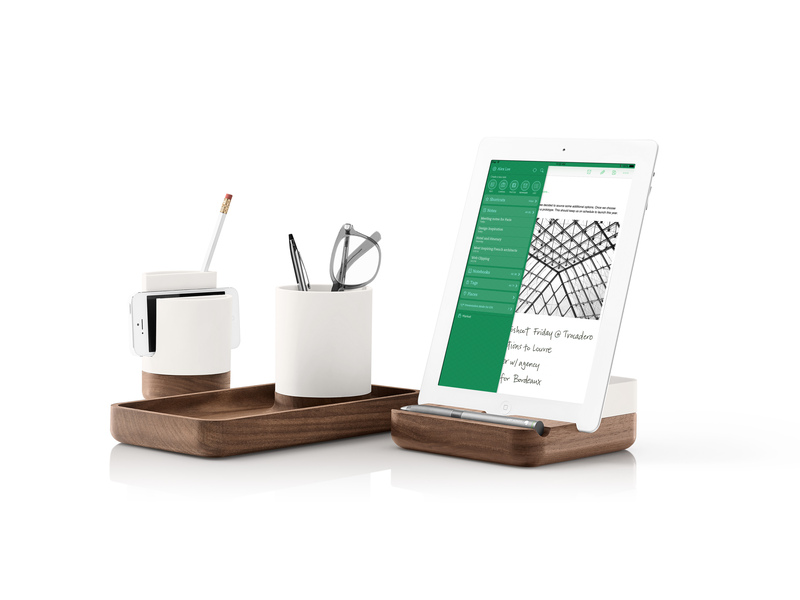 The first products, desktop accessories like the cups pictured above designed in partnership with Evernote’s Jeff Zwerner (who is also an Apple alum) are hitting Evernote’s virtual shelves now. Larger pieces, like objects to hold your phone, tablet and other devices pictured below, will coming later in the year, most likely to coincide with Evernote’s big Trunk conference in October. Interestingly, the aim for these physical products is very much global: Evernote actually chose China to debut the products, to coincide with the Market opening on the mainland. No word on whether we will see Pfeiffer furniture also get added into the mix. When we first saw Evernote Market’s debut last year, during the company’s big conference event, we were a bit surprised. Why was a company, focused around an app that helps people keep the many notes of their life in order, selling socks, we wondered. CEO Phil Libin his team, however, appear to be having the last (or at least latest) laugh. A spokesperson tells me that in the first ten months of Market life, it has brought in $10 million, with that rate of return apparently very consistent, going by numbers Libin shared in December. What that also might mean, though, if the proportions are holding true eight months later, is that Evernote itself is pulling in about $36 million annually in revenues. Again, however, it’s not confirming numbers of this kind. What is interesting is to think about Evernote Market in comparison to sites like Fab, which also offer lovely things to prettify your desk and other parts of your life. While we have heard many a story about how e-commerce shops struggle in the constant battle against large players like Amazon but also the push to reach workable economies of scale, perhaps what Evernote offers is the idea that you can in fact run a small sales portal or merchandise if it’s one that complements your core business. And on the other hand, could there potentially be a shift where the core business becomes the thing that ushers people into the actual revenue generation found from Market goods? In that vein, for a company like Evernote that needs to continue growing and diversifying its business, perhaps the Market is a very natural step to complete the picture of a company existing to make your note-taking and working life easier. To coincide with the news, we also got an update on related numbers at the company. At the moment, Market customers are a mix of Evernote power users and people using Evernote for free, meaning this is at least one way of monetising them, even if they’re not buying the paid tiers of the app. Right now the breakdown of Market customers is 49% Evernote Premium and Evernote Business users, and 51% “people who have never paid us before.” What’s more, it looks like Market may actually be a useful, pardon the pun, marketing tool. Of the 51% “non-paying” customers, 40% are Evernote free users but the balance are new to Evernote entirely, the spokesperson says. To date, the most popular products on the market have been the Jot Script Evernote Edition stylus, the ScanSnap Evernote Edition scanner and the Triangle Commuter Bag. That shows that gadgets and smaller objects are pulling in the punters. The question is whether Evernote’s baby steps into e-commerce are a passing fad, or whether they will have the staying power more akin to the longevity that Libin promises is the ethos of Evernote itself.